Because of this, marine-based operations frequently deploy ROVs in the area, to perform a wide range of tasks, such as collecting samples, monitoring pipelines, surveying underwater locations and etc. Sending a bot to complete work in underwater environments is considered to be exponentially safer and more cost effective, compared to the deployment of human workers. ROVs, during operation, use rugged and portable lights for illumination – even during mid-afternoon diving sessions, as visibility can easily be obstructed in underwater environments. Furthermore, the deeper the unit goes, the darker it gets due to decreased light penetration from the surface. The majority of underwater ROVs today, including units used for shallow dives, rely on a set of lights for illumination. However, some ROVs, like micro-class, electric-powered models without deep-diving capacities, may not activate the luminaries all of the time. On the other hand, deep-diving units, which includes working-class, hydraulic-powered ROVs equipped with grabbers and a 12,000-foot diving limit, can’t function without lights. These units are constructed of polymers, instead of aluminum or stainless steel. A trenching ROV is another example of a unit classification that requires high-powered lights. Equipped with up to 500 HP for extreme tasks, these colossal machines are used to lay thick cables, pipes, valves and other infrastructural components on the seafloor. ROVs are controlled by human operators, typically in a land-based remote setting. Cameras around the machine serve as ‘eyes’ for the remote operator. Because observation and critical decisions are based on images from the monitoring device, illumination is needed to achieve clarity. Monitoring devices on ROVs, which can be tethered for power, navigational safety and data transmission, must be versatile. The units should be capable of pan, tilt and rotation with full field of view. Overlapping field of views due to the use of multiple cameras on the ROV is tolerated (redundant safety practices). For deep-diving projects, Low-Light Level (LLL) cameras are used. As prolific lighting technologies continue to disrupt fast-moving sectors, the type of lamps used on ROVs has changed drastically in the past decade. According to Robert D. Christ, author of The ROV Manual: A User Guide for Observation Class Remotely Operated Vehicles, halogen fixtures were previously preferred by ROV operators. Although a major improvement from incandescent lighting, the outdated fixtures waste large amounts of energy on heat generation and come with limited lifespans. Moreover, halogen lights, when exposed to high pressure and due to its hot filament temperature, are prone to premature failure; or in extreme cases, the glass bulb could explode – resulting in fire and instant loss of light. Fluorescent lamps are not preferred by ROV operators, due to lack of illuminative output and capacity. Today, most ROV operators utilize LEDs for illumination. The energy efficient units offer instant toggling – a feature that is used often during deep-sea observations, especially when conducting experiments on nocturnal sea animals, of which some have never seen extremely bright lights in their lifetime. For boosting light output, ROV lights are equipped with reflectors. In most cases, parabolic reflectors are applied, though ellipsoidal variants may be used, when focusing light in small openings. The type of material used to create reflectors for ROV lights is aluminum. As a DC-powered luminary, LEDs are highly compatible with battery-powered ROVs. For extreme protection against pressure, the luminary’s housing can be constructed of titanium, like durable lighting systems in nuclear power plants. 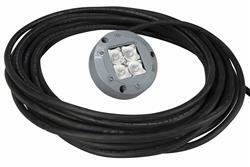 Most ROV lights available today are compact, taking on the shape and size of a conventional hockey puck or cylindrical flashlight. These type of ROV lights are designed to be mounted around the ROV and may be individually controlled. For intense illumination, a working-class ROV may be supported by a small ROV that hosts a large LED lighting system. This setup is useful for supporting working-class ROVs with multiple grippers, sensors and equipment. By moving all lighting components that would normally be on the working-class ROV to a compact, supplementary ROV, operators have more room for mounting tools. Additionally, the secondary ROV (with the LED lights) may also be equipped with a grabber. Red or Green for Diode Lasers on ROVs? Low-voltage lasers are used by ROVs to improve accuracy during observation, surveying and scaling. Because underwater environments are often dark or murky (even during the afternoon), diode lasers are leveraged to help guide the ROV, as it navigates around the seafloor, hulls (during inspection) and foundational structures on offshore drilling sites. During underwater installations, robust lasers may also be applied to ensure proper alignment of structures. Furthermore, a remote ROV operator could use a mounted diode laser to highlight specific objects during observation. Lasers for ROV missions can either be red or green (industry’s preference). Based on these two color choices, it’s important to highlight that humans are capable of seeing green up to 10 times more efficiently than red. Moreover, green light can pass through underwater environments with less absorption – resulting in a more intense laser beam. By comparison, red light is absorbed by water up to six times faster. With green diode lasers offering greater benefits than red lasers, why bother using the latter for ROV projects? The main advantage for using red diode lasers in underwater environments is enhanced temperature stability. According to Ocean News and Technology, red diode lasers boast an operating temperature range of -10 C to 50 C; while green diode lasers are limited in their operating temperature range, from 20 C to 28 C.
To conclude, unforeseen dangers and rewarding business opportunities (mostly for establishments in the oil and gas sector) associated with underwater environments, combined with the limitations of the human body (when it comes to thriving in oceanic locations for long periods of time), have paved the way for the rise of marine-based and autonomous ROVs. LEDs, which offer intense illumination with solid-state durability, are currently leading lighting adoption trends in the industry.